Debido a restricciones por parte del fabricante no podemos enviarle este artículo. Deuter products to the European Union. A lightweight and minimalistic hiking backpack. The minimal use of materials and its reduction to the essentials make the Lite back system an ultralight all-rounder and dynamic companion on day tours. Light, durable and ready for any alpine adventure thanks to its athletic V-shape design and anatomically shaped shoulder straps. This lightweight pack is designed with a tensioned delrin U frame which provides stability, meanwhile, the sternum strap fits across the chest which helps to stabilise the pack on the shoulders. Padded mesh shoulder straps deliver breathable comfort to the wearer, whilst the addition of a padded hip belt provides more carrying comfort. 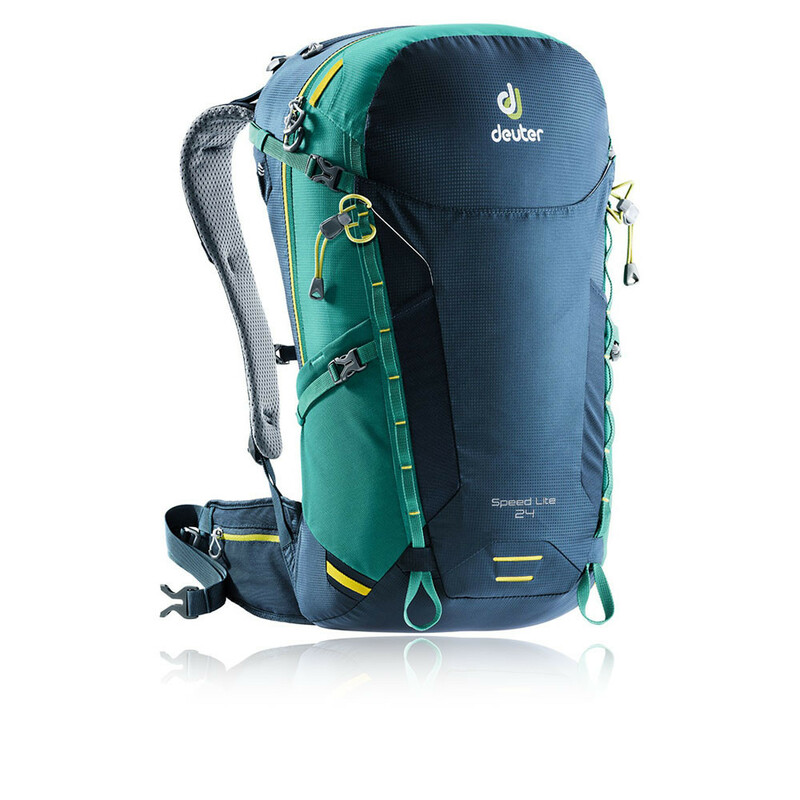 Deuter's lightweight backpacks come into their own during endurance sports and alpine day treks. Reduced to the essential, they are ideal for comfortably carrying light to medium loads depending on the volume. The pack features various sized pockets for all your needed essentials! Pockets can be found on the outside for those items you need quick access too, whilst a special pocket inside the pack is perfect to store valuable items. Two zipped pockets are located in the hip fins for items such as gels and nutrition, meanwhile, a stretch compartment inside the pack is useful for separating dirty/wet clothes. A sunglasses holder can be found on the shoulder strap, ideal for quick access and to store when not in use. If the backpack is full to the brim, don't worry as the exterior features a number of loops, perfect for attaching accessories such as an ice axe or hiking poles. Safety is key when out trekking, so to keep you protected, a safety light loop can be attached, while reflective elements help to enhance visibility in low light conditions. Additionally, an SOS-label can be found in the pack which provides the most important tips in case of an emergency. Lastly, for hydration on the go, the backpack is compatible with a Streamer 2.0L and Streamer 3.0L bladder which offers quick bursts of water when needed. Stay light and nimble in the Speed Lite 24 from Deuter. En el corazón de Deuter se encuentran los deportes al aire libre. Sus productos están diseñados para el disfrute al aire libre. En Deuter nos tomamos con responsabilidad proteger el medio ambiente y conservar la naturaleza para las próximas generaciones. Lightweight - For a comfortable fit. Delrin Frame - Tensioned Delrin U Frame provides stability with little extra weight. Outside Pockets - Perfect for items you need quick access too. Padded Hip Belt - Provides more carrying comfort. Sternum Strap - Stabilises the pack on the shoulders. Valuables Pocket - Special pocket on the inside of the pack to keep valuable items safe. Stretch Compartment - Located inside of the back to stowe sweaty/wet clothes. SOS-Label - Provides the most important tips in case of an emergency. Attachment Loops - For storing ice aces or hiking poles when not in use. Connectable Compression Straps - Compression straps can be connected at the front of the pack to attach equipment. Safety Light Loop - A small safety light can be attached to the loop at the front of the pack for visibility. Load Adjustment Straps - To individually adapt the pack's centre of gravity. Pull Forward Hip Fin - Allows an easy and precise adjustment. Shades Holder - Attachment for your sunglasses located on the shoulder strap. Lite System - Ideal for comfortably carrying light to medium loads depending on the volume. Two Zipped Mesh Pockets - Located on the hip fins. Reflective Logo Print - For enhanced visibility in low light conditions.